This product requires the base game Strategy & Tactics: The Wargame Collection. Only one superpower will gain the upper hand in World War III! The thunder of the cannons of World War II has died down. The gory conflict resulted in a shaky balance of power between the two victorious superpowers. But neither Moscow nor Washington are satisfied with this situation. Twilight dies into darkness... USSR vs USA is a full-fledged add-on for Strategy & Tactics: Wargame Collection that will make the perfect gift for every fan of alternative history. How would have the situation developed if the Cold War had turned into a global conflict? In the spring of 1948, Beijing becomes the target of a nuclear attack. The next day, the Soviet Union and China start a grand-scale incursion into North America. Fiercely resisting the invaders, the forces of USA and Canada slowly retreat inland... WWIII engulfs all of the continents in the blink of an eye! Pick a side in these alternative history campaigns and scenarios. There is also a surprise waiting in the Antarctic for those who love conspiracy theories: under the cover of polar night, the final Third Reich army is preparing to take its revenge... Is this some kind of madness, or a terrible future reflected in the past? Fight and win the war that was never meant to be! 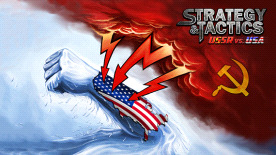 2 alternative history campaigns: a chance to experience WWIII from the point of view of its two opposing parties, the USSR and the USA, and their allies - communist China and Canada • 6 scenary maps - redraw European and American borders or fight Hitler's devotees in the icy wastelands of the Antarctic!